Billie Holiday (April 7, 1915 – July 17, 1959), also called Lady Day, was an American singer who, with Sarah Vaughan and Ella Fitzgerald, is considered one of the greatest vocalists in jazz music. Though without technical training or an outstanding vocal range, Holiday expressed a depth of private feeling and a distinctive phrasing that would influence later generations of jazz vocalists. Discovered by the legendary Columbia Records producer John Hammond, Holiday spent much of the 1930s working with some of the most noted jazz musicians of the the era, including the Count Basie, Benny Goodman, Duke Ellington, and most importantly, the saxophonist Lester Young. Young and Holiday would collaborate in what many consider some of jazz music's greatest recordings. Holiday recorded two of her best-known songs during this time: her own composition “God Bless the Child” (1939) and “Strange Fruit” (1939), a somber and racially charged composition about the lynching of blacks in the South. Her collaboration with white band leaders Benny Goodman and Artie Shaw was also groundbreaking recognition of black artistry in an era of strict racial segregation. Holiday's emotion-laden singing, influenced by the blues singer Bessie Smith and jazz singer and trumpeter Louis Armstrong, drew self-evidently from a life of emotional deprivation. Abandoned at birth by her father, she passed her youth in a succession of homes where she was abused, neglected, and possibly raped. Falling into prostitution while barely a teenager, she later became dependent on drugs and alcohol and was arrested several times on narcotics-related charges. She also gravitated toward glamorous, irresponsible, and abusive men, and themes of heartbreak and false love seared into her often-melancholy songs. By the late 1940s, Holiday’s heroin addiction and alcoholism began to diminish her voice. Despite drug-related arrests that limited her professional career, she made a series of critically acclaimed late recordings. Holiday died in near poverty at 44, placed under arrest for heroin possession while on her deathbed. 2 The Commodore years and "Strange Fruit"
While it is convenient to ascribe Holiday's art to her tortured life and reckless living, her singing transcends and to a degree universalizes hardship, testifying not to an artistic imperative for loose living but to the resilience of the human spirit. Holiday's art, while grounded in personal suffering, expresses empathy for the suffering without justifying self-inflicted harm through a life of irresponsible choices. Born Eleanora Fagan in 1915, in Philadelphia, Billie Holiday had a difficult childhood which greatly affected her life and career. Much of her childhood is clouded by conjecture and legend, some of it propagated by her autobiography, Lady Sings the Blues (1956), which is known to contain many fallacies and inaccuracies. Holiday grew up in the Fells Point section of Baltimore, Maryland. According to her autobiography, her house was the first on their street to have electricity. Her mother, Sadie Fagan, was allegedly only thirteen at the time of her birth (although this has been disputed); her father Clarence Holiday, a jazz guitarist who would play for the band leader Fletcher Henderson, was reportedly just fifteen. There is some controversy regarding Holiday's paternity, but Clarence Holiday accepted paternity, yet was hardly a responsible father. Raised primarily by her mother and a succession of relatives, the young girl changed her name to Billie, reportedly because she liked a movie star Billie Dove. Holiday dropped out of school in the fifth grade and cleaned floors and did other jobs in a nearby brothel, listening to the records of early jazz and blues artists. Particularly she was attracted to two of the most popular artists of the twenties, Bessie Smith and Louis Armstrong, both of whom had a great influence on her. When she was ten, Holiday was sexually assaulted and sent to a reform school for children. Scarred by these experiences, Holiday moved to Harlem in New York City to join her mother in 1928. According to her accounts, she was recruited by a brothel, worked as a prostitute, and even imprisoned for a short time. It was in Harlem that she started singing for tips in various night clubs in the early 1930s. According to legend, penniless and facing eviction, she sang "Body and Soul" in a local nightclub, reducing the audience to tears. She later worked at various clubs for tips, including Pod's and Jerry's, a well known Harlem jazz club. She was just twenty when the influential producer and talent scout John Hammond heard her fill in for a better-known performer and was astonished at the slow and emotionally suggestive quality she brought to jazz and pop standards. Hammond managed to get Holiday recording sessions with Benny Goodman, booking her for live performances in various New York clubs. In 1935, her career got a big push when she recorded four sides that became hits, including "What a Little Moonlight Can Do" and "Miss Brown To You." This landed her a recording contract of her own, and from 1935 to 1942, she laid down masters that would ultimately become an important segment of early American jazz. Sometimes referred to as her "Columbia period" (after her recording label), these recordings represent a large portion of her total body of recording work. During this period, the American music industry was still highly segregated, and many of the songs Holiday were given to record were intended for the black jukebox audience. She was often not considered for the "best" songs of the day, which were often reserved for white singers. However, Holiday's style and fresh sound soon caught the attention of musicians across the nation, and her popularity began to climb. Peggy Lee, who began recording with Benny Goodman in the early 1940s, is often said to have emulated Holiday's light, sensual style. In 1936, she was working with Lester Young, who gave her the now-famous nickname of "Lady Day." Holiday joined Count Basie in 1937 and Artie Shaw in 1938. She was one of the first black women to work with a white orchestra, an impressive accomplishment during that period. Holiday was working for Columbia in the late 1930s, when she was introduced to a song entitled "Strange Fruit," which began as a poem about the lynching of a black man written by Abel Meeropol, a Jewish schoolteacher from the Bronx. Meeropol used the pseudonym "Lewis Allen" for the work. The poem was set to music and performed at teachers union meetings, where it was eventually heard by the manager of Cafe Society, an integrated nightclub in Greenwich Village, who introduced it to Holiday. Holiday performed the song at Cafe Society in 1939, a move that by her own admission left her fearful of retaliation. Holiday later said that the imagery in "Strange Fruit" reminded her of her father's death, and that this played a role in her determination to perform it. She approached Columbia about recording the song, but was refused due to the song's subject matter. She arranged to record it with an alternate label, Commodore, Milt Gabler's alternative jazz label in 1939. She would record two major sessions at Commodore, one in 1939 and one in 1944. Although there were far fewer songs recorded with Commodore, some of her biggest hits were under this label, including "Fine and Mellow," "I Cover the Waterfront," and "Embraceable You." "Strange Fruit" was highly regarded and admired by intellectuals, and is in a large part responsible for her widespread popularity. 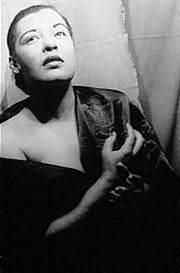 "Strange Fruit's" popularity also prompted Holiday to record the type of songs that would become her signature, namely slow, moving, love ballads. It is widely conjectured that this is the period where Holiday first began what would become a long, and ultimately fatal, history of substance abuse. Holiday stated that she began using hard drugs in the early 1940s. Her personal life was as turbulent as the songs she sang. She married trombonist Jimmy Monroe (a small-time drug dealer) on August 25, 1941. While still married to Monroe, she took up with trumpeter Joe Guy as his common law wife. She finally divorced Monroe in 1947, and also split with Guy. In 1947, she was jailed on drug charges and served eight months at the Alderson Federal Correctional Institution for Women in West Virginia. Her New York City Cabaret Card was subsequently revoked, which kept her from working in clubs there for the remaining 12 years of her life. I would say that the most emotional moment was her listening to the playback of "I'm a Fool to Want You." There were tears in her eyes… After we finished the album I went into the control room and listened to all the takes. I must admit I was unhappy with her performance, but I was just listening musically instead of emotionally. It wasn't until I heard the final mix a few weeks later that I realized how great her performance really was. 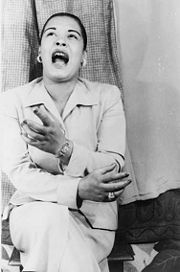 Billie Holiday photographed by Carl Van Vechten, 1949. On March 28, 1952, Holiday married Louis McKay, a Mafia "enforcer." McKay, like most of the men in her life, was abusive, but did try to get her off drugs. They were separated at the time of her death. Holiday was also rather openly bisexual and was rumored to have had several affairs with notable stage and film actresses, including Tallulah Bankhead, as well as with film director Orson Welles. Her late recordings on Verve Records are as well remembered as her Commodore and Decca work. From 1952 to 1959, Holiday released a little more than 100 new recordings for this label, which would constitute about a third of her recorded work. Her voice reflects a rugged timber on these tracks, reflecting a vulnerability in the once grand and bold diva. Her performance of "Fine and Mellow" on CBS's The Sound of Jazz program is memorable for her interplay with her long-time friend Lester Young; both were less than two years from death. Holiday toured Europe in 1954 and again from late 1958 to early 1959. While in London in February 1959, Holiday made a memorable televised appearance on the BBC's Chelsea at Nine, singing, among other songs, "Strange Fruit." Holiday made her final studio recordings (with Ray Ellis and his Orchestra, who had also recorded her Lady in Satin album the previous year) for the MGM label in March 1959 (included in her complete Verve recordings collection.) These final studio recordings were released posthumously on a self-titled album, later re-titled and re-released as Last Recordings. She made her final public appearance at a benefit concert at the Phoenix Theater in Greenwich Village, New York City on May 25, 1959. According to the masters of ceremony at that performance, Leonard Feather (a renowned jazz critic) and Steve Allen, she was only able to make it through two songs, one of which was Bessie Smith's classic blues "Ain't Nobody's Business If I Do." On May 31, 1959, she was taken to Metropolitan Hospital in New York, suffering from liver and heart problems. On July 12, she was placed under house arrest at the hospital for possession, despite evidence suggesting the drugs may have been planted on her. Holiday remained under police guard at the hospital until she died from cirrhosis of the liver on July 17, 1959, at the age of 44. In the final years of her life she had been progressively swindled out of her earnings, and she died with only $0.70 in the bank and $750 on her person. Billie Holiday is interred in Saint Raymond's Cemetery, Bronx, New York. Some fifty years after her death, Billie Holiday is among the most recognizable singers of the jazz era. Jazz and pop vocalists of the time usually sang melodramatic ballads and novelty songs associated with the Tin Pan Alley tradition and rarely explored emotional depths. Holiday's primary influences, the jazz trumpeter and singer Louis Armstrong and blues singer Bessie Smith were powerful exceptions whose lives mirrored Holiday's, and whose vocal delivery left no doubt they had lived through what they were singing. In her autobiography Holiday admitted, "I always wanted Bessie's big sound and Pops' feeling." Holiday's personal and emotional delivery revolutionized the jazz vocal tradition by personalizing even the most banal material with a authentic and inimitable emotion. Holiday's unconventional aesthetic sensibility led her to refine beat and the melody, often reinventing the standard melody with harmonies borrowed from her favorite horn players, Armstrong and Lester Young. Holiday's best performances remain among the most sensitive and original vocal performances ever recorded. The artistic stature of Holiday muic only grew after her death. She influenced such singers as Janis Joplin and Nina Simone, and in 1972, Diana Ross played her in a movie version of Holiday's autobiography, Lady Sings the Blues. The film was a commercial success and earned an Academy Award for Best Actress nomination for Ross. In 1987, U2 released "Angel of Harlem" as a tribute to Billie. Holiday struggled against racism her entire career and achieved fame despite a turbulent, often self-destructive life. She is also often cited as an example for her early efforts to stand up and speak out against discrimination and racism. She is now considered one of the most important vocal stylists of the twentieth century. ↑ John Bush, All Music Guide, Billie Holiday. Retrieved March 4, 2008. Blackburn, Julie. With Billie. ISBN 0375406107. Clarke, Donald. Billie Holiday: Wishing on the Moon. ISBN 0306811367. The Unofficial Billie Holiday Website. Brief biography at American Masters (PBS). This page was last modified on 16 December 2016, at 16:46.